"The Getty case is just a slice of an illicit global trade in antiquities that stretches from the Egyptian desert to Chinese tombs to Peruvian monuments, and pulls in some of the most- respected names in art and academia". An article looking not only at the recent dramas at the Getty, whose curator goes on trial later this month, but at the incidence of smuggled items in other U.S. museums and the efforts of nations to protect themselves against smuggling. Egypt's high-profile efforts receive some attention: "In the three years since Hawass took over, Egypt has recovered 2,000 objects from overseas, mostly from auction houses and dealers". This Bloomberg article is long and rather fragmented, but there is interesting information scattered within it. In another article, from Science Daily: " Italian investigators say some antiquities in New York's Metropolitan Museum of Art and a major private collection were illegally excavated and exported". "Amid displays about Antebellum Nashville and how the state Capitol was built, the Tennessee State Museum features a haunting exhibit: A 3,600-year-old Egyptian mummy. Visitors strolling through the museum might find the mummy jarring, or at least out of place. Enclosed in a glass case, the mummy is unwrapped; the skin of his entire body is exposed. That skin appears leathery and taut against his skeleton. In a word, after being lulled by the heroic history of Daniel Boone and Andrew Jackson, it's downright scary . . . . The state museum, by and large, has not been pulled into a growing global debate over whether mummified remains and other cultural artifacts should be returned to the country of origin". And, umm, according to a psychic, the mummy's ghost didn't like moving premises. See more on The Tennessean website, above. Ian Bell's somewhat entertaining review of last night's first episode of the six part dramatized story of Howard Carter and Lord Carnarvon doesn't rate it too highly: "Trivia question: what's the real curse of King Tut? What is the ancient malediction sent down over 3000 long years just to make us wonder about the brevity of life? Possibly it's the sheer number of books, documentaries and dramas that have been made about Howard Carter and the discovery of the last, intact pharaonic tomb in the Valley of the Kings. 'One day,' the boy-king must have said to himself, 'no-one will know anything about any ruler of Egypt save me, and they will go on hearing the tale over and over again. Such is my curse.' He was good enough to chuck in lots of shiny things to sweeten the deal, of course". Bell's main criticism is that the characters are too thinly drawn, with no insight about what motivated the obsessive Carter. See the full article for more. The second URL is the printer-friendly format which shows the enitre article on one page. The regular feature on the Egyptian Gazetter website where Zahi Hawass talks about his experiences: "On March 2, 1996, Mansour Boriak, my most experienced and trusted archaeological assistant burst in to my office, yelling 'Doctor! Doctor! Ashry Shaker is here. Something important has been discovered in Bahariya Oasis!' Mansour is a prankster and often tries to fool me. However, he kept insisting that there was exciting news from Bahariya. I refused to believe him until Ashry Shaker, the director for the Antiquities Department of the Oasis, came into my office. Ashry informed me that an amazing tomb had been found.The afternoon of March 1 , guard, Abdel Maugoud, was working at the temple of Alexander the Great. While standing there, Maugoud noticed a donkey running with his lead rope in his mouth. This was unusual because donkeys don't run; they don't like the lead ropes, and they never voluntarily take them into their mouth. Maugoud could not leave his post to chase the donkey. The donkey stopped about a mile away and then came back to the temple with the rope in his mouth. Finally, a replacement guard appeared and Maugoud took the donkey and started home. The stubborn donkey refused to go and took Maugoud back out into the desert to the exact spot where he had ran away earlier. The donkey then dropped the rope near a hole in the ground. Maugoud dismounted and peered into the hole, and he saw gold shining deep within the sand. Immediately, he ran off and told Ashry Shaker. Ashry invested the hole and as he peered in he saw part of a mummy's face looking up at him. Even more surprising was that the face was shinning and appeared to be made of gold. I drove to Bahariya a week after receiving the news. After preliminary work was done, we reburied the tombs to prevent tomb robbers from plundering the site, because there were no funds to launch a full-scale excavation. My first priory is always conservation and restoration. In June 1 999, when we were able to resume excavations, we announced this fantastic find. Virtually overnight the Valley of the Golden Mummies attained international fame". This is the entire piece from the Egyptian Gazette website, copied in full because it will probably be replaced tomorrow. I always post updates re magazine and journal publications when I know of them, because I believe that they are of interest to visitors, but I rarely post about any other commercial ventures - in spite of a number of requests to advertise tours. However, Yare Egyptology is an online store with a difference. Brian Yare has been established for many years, selling electronic publications of out of copyright books, many of them completely impossible to get hold of outside academic libraries. The books come on CD-Rom in either PDF or HTML format, and are fully hyperlinked for ease of navigation (For a demos of how they work go to http://www.egypt.e7even.com/demo/index.htm). The full cataloge is available on the above site, and new additions to the catalogue are posted at a Yahoo! group. To give you an idea of the sort of book available, here are three of the most recent additions to the catalogue, added in October: Norman de Garis Davies, The Tomb of Two Sculptors at Thebes (very rare and beautiful), Petrie, 1890, Kahun, Gurob, and Hawara (reports of his privately funded excavations), and Piehl, 1895 and 1903, Inscriptions Hiéroglyphiques Recueillies en Égypte, Series 3 (100 plates of hand-drawn inscriptions taken from museums in Europe and Egypt, with a commentary and translation in French). The website for the Journal of African Archaeology is now showing the contents for Vol. 3 (2) 2005, due for release in December 2005. The full contents listing is on the above URL, but I have listed below those specifically dealing with Egypt. B. Eichhorn, S. Hendrickx, H. Riemer & B. Stern: Desert Roads and Transport Vessels from Late Roman-Coptic Times in the Eastern Sahara. P.M. Vermeersch, P. Van Peer, V. Rots & R. Paulussen: A Survey of the Bili Cave and its Surroundings in the Red Sea Mountains, El Gouna, Egypt. S. di Lernia: Review of Andrew B. Smith. African Herders: Emergence of Pastoral Traditions. G. Pwiti: Review of David W. Phillipson. African Archaeology. Advice from the Cairo Magazine about anyone visitng Cairo who likes the idea of riding out to the pyramids on horseback. The above is a new website, which is the official Web site of the Ancient Egypt Research Associates (AERA), specifically Dr. Mark Lehner and the Giza Plateau Mapping Project. It is a good looking site, with some nice features, including a search engine, details on current projects (including an interactive map of the Lost City), an overview of the use of Geographical Information Systems (GIS), a page showing highlights of some of the artefacts found, and a "Resources" page. The Resources page offers free document downloads (in PDF format) of, amongst other things, AERAgram, the official newsletter of Ancient Egypt Research Associates, and three excellent articles from Journals, written by Mark Lehner. Good photographs appear throughout. AERA was established in1985 "for the purpose of funding and facilitating the research of the Giza Plateau Mapping Project", and there are details on the site about how to donate to the Project. It is well worth spending some time to look around this very informative website. This item is in the Saturday edition of the Egyptian Gazette, the Egyptian Mail, and should be on the site for the rest of this week, after which it will be replaced and the above link will take you to a different article. However, anyone wanting to see the piece after this time can email me - I've saved a copy of the complete item. "After its many problems last year, the Supreme Council for Antiquities (SCA) has started to develop the basement of the Egyptian Museum in the light of the anxiety about the artefacts that have gone missing from the basement. The development project will cost LE12 million, after the committee registering the 600,000 or so artefacts has finished its work". Although it is a short article, it manages to provide a scary insight into the problems that the museum faces. A site which requires you to register before you can view its content. For some reason I was able to get through to the page concerned without registering, but only on the first occasion I tried. Anyway, here's the gist of it. A female mummy whose name was Isit Ha, about whom very little is known, is now located in the Rutgers Geology Hall of the Old Queens Campus in New Jersey, having been transferred from New Brunswick Theological Seminary. It was taken to New Jersey by a missionary who brought it back from Egypt The mummy dates to c.320/33BC, and her age at time of death has been estimated at around 17 years of age. Both the mummy and the coffin are on display together with four stone artefacts which resemble canopic jars but are in fact completely solid, and not containers. "Images on the lid include her own burial ceremony, jewelry she wore and an image of the winged goddess Nut". There is a photo accompanying the piece on the site, showing the gold decoration on the top part of mummy's coffin and the top half of the mummy itself. "BBC news: the Corporation is offering a red-button application to accompany its new historical drama-documentary series, "Egypt," which traces how the mysteries of ancient Egypt were uncovered by three renowned Egyptologists: Howard Carter, The Great Belzoni, and Jean-Francois Champollion. The application, which is available on all the UK's major digital TV platforms after each of the series' six episodes, presents viewers with a mystery game that expands on the story of the curse of Tutankhamun. The game introduces viewers to Count Louis Hamon (an actual historical figure) who is seeking to lift the curse, and sets them a number of challenges to help him do so. The challenges involve tracing the origins of a 'mystical mummified hand' and reuniting the ashes of the hand with a sacred mummy. At the same time, however, viewers have to determine whether Hamon is a genuine mystic, as he claims to be, or a charlatan. The app requires viewers to use the number keys on their remote to choose between various options, in order to unlock the next stage of its narrative. The BBC says that viewers who successfully navigate the app will be able to win "an exclusive scarab if they dare to take on 'the curse.'" "
Ashraf Ashmawi, legal consultant in the SCA, told Al-Ahram Weekly that changes in the 1983 law focussed on five articles. The first was properly and legally to identify three main terms -- the SCA's permanent committee, the inviolable area around every monument, and the land found next door to the archaeological site -- in an attempt to provide all necessary security measures and a healthy environmental atmosphere The second article to be repealed is the section of the law allowing possession of antiquities. A year after the approval of the law all owners of Egyptian antiquities must hand over all objects to the SCA, which in its turn will install them in their archaeological storehouses. Ashmawi continued that Article 7 of the old law stipulating that the police were the only department authorised to remove any encroachments on archaeological sites or monuments had been changed. Such responsibility is to be given to the SCA's secretary-general, or to someone he entrusts, while the police agencies will only be a safeguarding agency while executing the secretary-general's decision. Article 30 has been added to the law stipulating that the SCA is the only authority competent to carry out restoration and preservation work for all Egyptian monuments, archaeological sites and historical edifices. The minister of culture will have the authority to assign any scientific authority or mission to execute any such work, but under complete supervision of the SCA's secretary-general. As for penalties, according to Ashmawi all these have been doubled or tripled. "Egyptian antiquities were often the price paid for building modern Egypt, writes Jill Kamil. Muhammad Ali used antiquities as a diplomatic lever. His ambitious plan to modernise Egypt required foreign expertise, and sensitive as he was to Western fascination with the country's ancient monuments, he charmed professionals to Egypt by offering them a free hand to collect whatever they wished . . . . Muhammad Ali is not exceptional among the leaders in the world in trading works of art or ancient monuments for know-how and technology. Until today objects remain diplomatic playthings in the hands of politicians. What is remarkable is the sheer volume of Egypt's ancient treasure that made its way abroad. The loss to archaeology and ancient history is staggering". A fascinating article - well worth going to the above page to read the full story. Writing for Al Ahram Weekly, Serene Assir describes a trip to Sohag: "Not an area to be visited by lazy tourists who seek all sites to be laid out for them on a silver tray, ready for them to take their quick snapshots and run off back to their luxury hotel, Sohag is, by contrast, a crucial spot for any traveller to visit if in search of a true understanding of modern and ancient Egypt, and of how the two continue to interact". Included in her account are details of several sites in Sohag including those at Akhmim and Abydos. Click on the photograph on the page to see more photographs. In Hawass's regular Dig Days piece, this week entitled Adventures in the Step Pyramid, Hawass describes entering one of the Queens' pyramids located south of the Menkaure Pyramid at Giza, and the Step Pyarmid of Djoser at Saqqara: "Although I had visited the substructure of the Step Pyramid of Djoser at Saqqara from the south entrance, which was opened in the XXVIth Dynasty, about 500 BC, this time I decided to enter from the original north entrance. The substructure of the Step Pyramid is known to be about three and a half square miles, and since it was cleared by Firth, Gun and Lauer we can see that many stones have fallen making it a very dangerous area to visit". See the above page for the full account. The World Heritage Committee's newsletter following the 29th session in July, gives details of sites added to and removed from their list of world heritage in danger. Amongst the additions is the Wadi Hitan (Whale Valley) in the Faiyum Depression, southwest of Cairo. This one, which I missed, was shown on the EEF Newsletter (which will be online on Sunday, when I will post details): " Following the arrival of Darius the Great the Achaemenid king, in Egypt, Egyptians who were proud of the water of the Nile River and their country springs, imitated the technique used by Iranian aqueduct diggers to provide water for their dry lands. Historian Parviz Shahryari believes that aqueduct diggers went to Egypt with Darius to teach the Egyptians the method of digging aqueducts. According to Shahryari, it was Walter Hinz, the German archeologist and Iranologist, who found out this issue for the first time".
" The Pyramids of Egypt are arguably the most famous and grandest of the Seven Wonders of the Ancient World, yet only a small percentage of people have ever viewed them live -- until now. PyramidCam.com provides the first live view of these ancient and beautiful monuments, seen through the lens of a high definition network camera (http://www.pyramidcam.com/)". The ideas is that the webcam that lets you view the pyramids from your computer in the next best thing to real time. The PyramidCam website also has a page of the best photos taken by the webcam so far, sunset and sunrise times in Egyptian time. 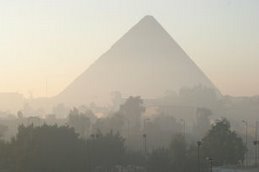 The introduction on the site lets you know which days are best to use the cam (less traffic smog on a Saturday and Sunday, for example), and which times and weather conditions are best: "When the weather is misty or foggy in the Nile Valley and the sun begins to warm the atmosphere and burn off that fog, Khufu and Khafre will slowly emerge out of the mist like two huge ships, tops appearing first - a viewing delight". Good fun. See both URLs for more information. "King Tutankhamun was a red wine drinker, according to scientists who have been studying residue left in wine pitchers in the ancient pharaoh's tomb. Wine was a luxury drink in ancient Egypt and bottles were labelled with the wine's name, year of harvest, source and even vine grower. Until now the colour of the wine was unknown, as it dried out over time. A team of Spanish scientists developed a new technique able to pinpoint an acid left by compounds in red wine". See the full article for more details. Historian Marshall Clagett has died at the age of 89 in Princeton. As well as his well known writings about Archimedes and the history of medieval science, he also contributed to the field of Egyptology: " In his most recent work about science in ancient Egypt, Clagett used computers to interpret hieroglyphics. At the time of his death, he was also completing the fourth and final volume of a work titled Ancient Egyptian Science." A short piece by Hassan Saadallah about rennovations to the temple of the Deir el Bahri temple of Queen Hatshepsut: "An urgent project will start soon to preserve the el-Deir el-Bahari Temple of Queen Hatshepsut in Luxor, on the instructions of Minister of Culture Farouk Hosni. The project will cost LE7 million, as part of a grant from the US Research Centre to preserve and develop the Valley of the Kings. The total grant is estimated at US$10 million. Supreme Council for Antiquities Secretary-General Zahi Hawass said that the project includes providing the Temple of Queen Hatshepsut with close circuit cameras to monitor visitors inside the temple for security purposes. He explained that visitors will only be allowed in through one entrance, which will be an electronic gate for checking visitors' personal belongings. Hawass added that lighting round the temple will be upgraded to allow visitors entry at night, especially in the summer". This is the full item on the Egyptian Gazette. An article about returning items held temporarily by Oxford University to the University of California, Berkley, and reuniting a sequence of papyrii that have been separated since the 1950s: "Just a few weeks ago, three tins of ancient papyri belonging to the University of California, Berkeley, finally arrived home, shipped across the Atlantic more than a century after they were collected in Egypt". For the full story of how the papyri were originally mislaid and have now been returned, see the above web page. "Many ancient cultures practiced mummification . . . . Mummies have been found in the Middle East, Andes mountains of South America, Peruvian desert, western China and parts of Scandinavia. The most widely-known mummies are Egyptian, they are the focus of much folklore and superstition. Egyptians practiced mummification as early as 3400 B.C. Ancient Egyptians believed in a spiritual rebirth after death. It was important mummified corpses resemble the living person because the soul used them in the afterlife . . . . Families concerned for the safety of their deceased loved ones often carved curses into tomb and crypt doors. A mummy onboard has even been blamed for the sinking of the Titanic". See the full article for more about Egyptian practices of mummification. From the National Geographic webiste: "Archaeologists have excavated a trove of Stone Age human skeletons and artifacts on the shores of an ancient lake in the Sahara. The seven nearby sites include an extensive cemetery and represent one of the largest and best preserved concentrations of ancient skeletons and artifacts ever found in the region, researchers say.Harpoons, fishhooks, pottery, jewelry, stone tools, and other artifacts pepper the ancient lakeside settlement. The objects were left by early communities that once thrived on the former lake's abundant fish and shellfish". The date(s) have been put at between 10-5k BP, which would work for Neolithic, and there is pottery and grinding stones. 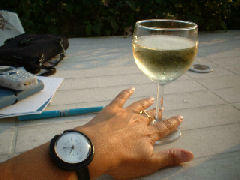 . . .it seems to be fairly extensive at least seasonal occupations. It seems similar to habitations found by Wendorf et al. around some of the now-dessicated playa lakes in the western deserts of Egypt and elsewhere". See Tony's posting, above, for more information. "San Francisco Mayor Newsom Gavin attends Monday an Egyptian cultural night organized by the Egyptian consulate in the city to make the formal inauguration of the Egyptian antiquities exhibition "Hatshepsut from queen to pharaoh". The event will be also attended by Nancy Pelosi, leader of the Democrat minority at the House of Representatives and a large ' number of businessmen, diplomats, and artists in California. Egypt's consul general in San Francisco ambassador Abdel Rahman Salah said the number of Americans who visited the exhibition in the first week exceeded 150,000". "In 1987, I was appointed Director General of Giza, Saqqara, and Bahariya Oasis and set to work dealing with many problems facing these sites. I began setting up controls to collect fees from visitors and limited the number of people entering the pyramids. Furthermore, I fought off a ring road that would have run near Giza and threatened the monuments; and set up a site management plan that included excavation and preservation.The last great Egyptian archaeologist Selim Hassan, the last to excavate Giza before I came, stated that the plateau held no more secrets and that everything had been found. But, the last fifteen years have proved him wrong and have made many important discoveries.During the last few years, I have received national and global recognition for my work. The foreign press in Cairo gave me the Pride of Egypt Award, and Mansoura University, honoured me for my contributions to Egyptian society and the archaeological community worldwide.In 2000, I received the Distinguished Scholar of the Year from the Association of the Egyptian-American Scholars, and was presented with the Silver Medal from the Russian Academy of Natural Sciences. Recently, I was chosen by the National Geographic Society as their eighth Explorer-in-Residence. Two of the most important honours I have received are, the First Class Award for Art and Science, presented to me by President Hosni Mubarak in recognition of my achievement and conservation of the Great Sphinx. The other special award was given to me by my home village and held in the courtyard of my primary school. It was wonderful to see all the smiling faces of my family and friends and I could not keep back my tears. The American Academy of Achievement awarded me a Golden Plate, placing me in the company of several Nobel Prize winners. Recently (2005), I was given an honorary degree of Doctor of Humane Letters from the American University in Cairo.In 2002 I was promoted by Egypt's Minister of Culture, Farouq Hosni, to Secretary General of the Supreme Council of Antiquities, the top antiquities job in Egypt". "Head of Aswan and Nubia monuments Mohamad El Beyali said some 5,000 tourists of various nationalities arrived in Aswan to watch the Sun perpendicularity on the face Ramses II statue in Abu Simbel. Aswan governorate prepared an integrated tourist programme on this occasion including a show of Nubian folklore and songs depicting stages of Abu Simbel area". This is the full SIS item. "The tomb of Amenemhat TT82 has been entirely rewritten by Jon Hirst, according to Charlotte Lejeune's work specifically written for OsirisNet. Charlotte is an egyptologist specialised in the middle kingdom and the nomarchs of that period. It has been enhanced with many new photographs and line drawings". And for French readers: "La tombe d'Horemheb est enfin traduite en Français: Je vous rappelle qu'elle s'accompagne d'une visite en réalité virtuelle dont vous ne trouverez aucun équivalent sur le web. Avec les tombes d'Akhénaton, de Toutankhamon, de Ay, d'Horemheb et de Ramses I, c'est maintenant l'intégralité des tombes royales de la période amarnienne et du début de l'ère Ramesside qui sont décrites sur OsirisNet". This will only be here for today. It is too long to copy in its entirety into the blog, so if you're interested in the article, today is the day. Following the success of the tourists visiting Abu Simbel to see the sun light the face of Ramesses, this looks at tourism in the Aswan area: " It is by all means qualified to become an international tourist destination. It is a complete and independent tourist site that contains all types of tourism including entertainment, cure, fishing, safari and antiquities as well as river tourism. Aswan is very rich in its tourist product; yet it lacks the attention of its people, its cities, the travel companies and the Ministry of Tourism itself"
This one is only going to be of interest if you read Hebrew or have a friend to translate. Thanks to David Meadows and his excellent Explorator news email (issue 8.26 explorator@yahoogroups.com) for this link which I had missed myself. I don't read Hebrew, but according to Explorator it is a review of a recent translation into Hebrew of the El Amarna letters by Dr. Zipora Cochavi-Rainey. An article about the making of the film which explores the river from its source in Ethiopia, to Alexandria: "The roar of Tissisat Falls in Ethiopia is wondrous to hear - you can almost feel the spray. Camel lovers will delight in the many opportunities to study the animals up close. The peek inside Nefertari's tomb in the Valley of the Queens also is breathtaking". See the St Louis Today website for the full story. "The basement of the Egyptian Museum will be opened to visitors. Zahi Hawass, head of the Supreme Council of Antiquities, declared that a contract has been signed with a state-owned company to insure and reorganize the Egyptian Museum’s basement before making it accessible to visitors. The decision comes after several items from the basement storage area have been 'lost' or stolen in the past year, to the embarrassment of those responsible". This is the complete bulletin on the Cairo Magazine website. This is a copy of the complete letter to the Reader's Page of the Cairo Magazine, by Raoul Chomka, entitled Comments on Qatameya, but focusing on the building of a new shopping mall on the site of the city of On: "Thank you for the excellent article on the Qatameya Rock Forest. Did you know that there are even worse cases? The German Archaeological Institute has just finished excavating at Heliopolis (Matareya) one of the most important sites in Egyptian history: the remains of the ancient city of On. The temple area is older and larger than that of Karnak. Now, building of a huge shopping mall has started right on top of the temple! It will cut through the temple’s main axis and its causeway. The Supreme Council of Antiquities doesn’t want to get involved so as not to cross the authorities in Heliopolis. The Germans are frightened and don’t want to say anything, as they might lose their permit to excavate. How is this allowed to happen? Would they build a mall in Karnak? I think that On deserves at least one article before its center is destroyed". For those of you interested in areas outside Egypt, but which form a significant part of Egyptian history, this BBC article about the archaeology of Gaza may be of some interest: "For more than 3,500 years Gaza's history has been shaped by its location. It sits on the route linking North Africa with the greener lands of the Levant to the north. This made Gaza strategically important first to the Egyptian Pharaohs, and then to many others who sought to wield power in the region". "The Department of Pre-Dynastic Monuments, an affiliate of the Supreme Council of Antiquities, will produce a documentary on life of ancient Egyptians who lived in the pre-dynastic era. According to Culture Minister Farouk Hosni, the documentary sheds light on ancient Egyptian's daily life. 'The film is aimed to be a historical reference for specialists in that era,' said Hosni. The film is inspired by the concept of the Pharaonic Village, according to Secretary General of the Supreme Council for Antiquities Zahi Hawass. 'The film will shed light on different means of living of the early man, his hunting tools, how he cultivated the land, and funerary items. The documentary is expected to correct some wrong concepts and beliefs that have spread among historians about that era,' added Hawass. Various copies of the film will be available at archaeological sites, said Khaled Saad, the director of the Department of Pre-Dynastic Monuments". "Three men have been jailed for life over a scam to smuggle artefacts worth more than $50m out of Egypt. Those found guilty include the former head of Egypt’s Supreme Council of Antiquities, Abdul Karim Abu Shanab. He was accused of giving smugglers certificates showing genuine artefacts were imitations, so they could be carried through customs . . . . Four other defendants received sentences ranging from fines to 15 years in prison. They included a Swiss citizen and a German of Egyptian origin. Four of the seven, including the Swiss and German, were convicted in their absence. Another three were acquitted. Officials estimated the smuggling gang exported some 57,000 pieces worth about $55m, including human and animal mummies, coins, statues and wooden sarcophagi. . . . Egyptian law says only reproductions of antiquities can be exported, so many of the items were given certificates to show they were fake." "Egyptian has become the motif du jour, inspired by Tutankhamen and the Golden Age of the Pharaohs, a four-city traveling exhibit. The boy king may seem an unlikely design muse, but he has proven an inspiration since his burial chamber was discovered in 1922. The result back then was a worldwide craze for Egyptian design. He inspired decor from the grave again in 1976 with The Treasure of Tutankhamen exhibit. And now he promises to do it again. Savvy buyers — from specialty stores to discount home furnishings retailers — have recognized that King Tut’s return to the museum circuit could mean a new epidemic of pharaoh fever". See the full article for more. On this day in 1969 . . .
Scientists examining the 3,000-year-old mummy of King Tutankhamen of Egypt determine the boy had been murdered by a sharp blow to the head. I was going to save this very short bulletin from the Cairo Magazine for the trivia slot on Saturday, but it is actually an important topic, so as improbable as the whole thing sounds, I've posted it today: "Leila Elwi will act in an Egyptian-Swedish movie called Al Ahramat bi Laun Al Mafia (The Pyramids in Mafia Colors). The movie is about the destruction of historical monuments in Egypt". There are several items about the Bibliotheca Alexandrina on the Egyptian Mail website today - it will probably be on the page for the rest of the week, but won't be around after next Saturday. It talks about Alexander, his campaigns, the creation of this and other libraries, and the destruction of the Alexandrian library. The exhibition Mummies: Ancient Egypt and the Afterlife is travelling to Australia shortly: "A large collection of rare Egyptian artefacts has arrived at the South Australian Museum. It includes a 2,700-year-old mummy known as "Keku" and around 250 other Egyptian objects, mostly from a Dutch antiquities collection. Australian Museum conservator Heather Bleechmore says the touring exhibition looks at ancient Egyptian rituals like the embalming of dead bodies 'And how the Egyptian embalmers as well as all the other workers were involved in that process, because it was an amazing part of Egyptian life,' she said. The museum is confident the collection will attract curious visitors. The museum's head of public programs, Mark Judd, says the it paid nearly $300,000 to host the exhibition in Adelaide. The exhibition opens next month, and is in Adelaide until February". "A bank robber dressed as an Egyptian mummy staged a successful raid on a bank in Vienna. The bandage-clad robber walked into a bank in the Austrian capital and stood in line waiting to be served. He then passed the cashier a piece of paper saying he had a hand grenade hidden in his bandages - and demanded all the money. He then quietly walked out with a bag filled with cash before police could arrive". "The Shadow of Aten isn't due until the last quarter of 2007. That's at least two years away. Yet here we are, with screenshots and information. Ridiculous, isn't it?It's being developed for Xbox 360 and PC by new Spanish sorts Silicon Garage Arts, who seem quite keen to make the game a bit intellectual. It's set in Egypt of the 1930s, and based around the god Aten, the first attempt at monotheism (worshiping just one god, for the benefit of the hard of thinking) by the pharaoh Akhenaten. Various materials will be provided with the game, giving background information on related matters, all endorsed and sponsored by the History Channel and the Louvre.The game itself, we're assured, will 'have non-stop action, suspense, mystery and provide a high degree of entertainment whilst also providing an indepth knowledge of ancient Egypt.' More specifically, free-form combat will feature, as will platforming, puzzles, vehicles and mini-games". "A prominent Egyptian archaeologist has refuted the widely held belief that the sun illuminates the inner sanctum of the main temple at Abu Simbel only on 22 February and 22 October, the birthday and the date of the coronation of Pharaoh Ramses II. On those two days every year the sun's rays shine on seated statues of the sun gods Re-Horakhty and Amun-Re, and a statue of Ramses II. The statues sit in the company of the Theban god of darkness, Ptah, which is shrouded in shadow all year round. 'The sun lights up the statues on the two days in the year that mark the beginning of 'summer' and 'winter' according to pharaonic agricultural calendar,' archaeologist Mohamed Hamid told the Middle East News Agency. Abu Simbel will witness a rare phenomenon when the rays of the sun penetrate the darkness for more than 60 metres inside the temple to illuminate the seated three statues except for that of Ptah that remains in the dark all year round, he added". This is the complete item from today's Egyptian Gazette. "With the UNESCO campaign for safeguarding the Nubia monuments, initiated some 45 years ago, Egypt marked the launch of one of the first large- scale cultural heritage salvation initiatives in the history of mankind . . . . The modern threat to the survival of the unique temples demonstrated that the conservation of the world's common heritage concerned all countries". See the full story, above. A travel article looking at what the Minya area has to offer visitors, taking in the archaeology in some detail. Particular sites focused on are the 11th Dynasty tombs of Beni Hassan (with some good descriptions of tomb construction and decoration) and Ptolaemaic Touna al-Gebel (East Hermopolis): " The following morning I headed to Beni Hassan, a half-hour ride on the Eastern bank of the Nile. The area is named after a Bedouin tribe which used to live there, probably a few centuries after it was part of the Middle Kingdom's Oryx nome. Climbing up the steps to the mountain tombs is quite a workout, especially if you go when the sun is on full blast. A hat and a few bottles of cool water are an utter necessity for this exhausting hike. When you reach the top of the cliff you realise that your efforts did not go in vain." Many thanks to my Official Nitpicker Chris Townsend for pointing out that this article, which I posted yesterday, is actually 3 weeks old. For some reason, I've only just picked up on its existance. Hopefully it will be new to one or two readers as well. In a recent poll to find a new "7 wonders of the world", readers of a UK travel magazine relegated the pyramids to 8th place: "Readers of Wanderlust , Britain's leading magazine for real travellers, have updated the millennia-old list for the 21 st century. Overall, 3,569 travellers' votes were counted in the largest survey of its kind ever. The results reveal what today's travellers view to be the most extraordinary sights on the planet. The clear voters' favourite is the lost Inca city of Machu Picchu, Peru, which received 52% more votes than its nearest rival, the vast temple complex of Angkor , Cambodia". See the above press release for the rest of the results. Los Angeles film producer Tom Teicholz visits LACMA (Tutankhamun) and the Bowers Museum (Mummies: Death and the Afterlife) to review the exhibitions currently showing there, and ponders about the afterlife: "As for King Tut, he lived only 19 years, and yet thousands of years later, he is still among us, still on tour, because grave robbers couldn’t find his tomb before Carter did. Is this kind of immortality a reward or a curse? I say it’s one more mystery of the afterlife for us to ponder". See the above URL for the full article. Another short article about the opening of the M.H. De Young Museum, and the Hatshepsut exhibition which opened this month, with a couple of photos. I was recently going through my Egyptology Portal site checking for broken links when I found that the Dakhleh excavation link at the Monash website was no longer working. However, Peter Stagg kindly emailed with the new location, and you can now find the annual reports at the above link (the most recent is the 2003-2004 report). For a round up of exhibitions, symposiums and lectures, new digitized texts and other news, see last Sunday's publication of EEF News. A brief summary (with bibliography) of the main themes from Origines 2, the conference held in Toulouse (France) last month, which focused on prehistoric and predynastic Egypt. A more detailed summary is being planned by the conference organizers. The Travellers in Egypt website has been updated with this piece written in 1830 by Mrs Colonel Elwood from Narrative of a Journey Overland from England, by the Continent of Europe, Egypt, and the Red Sea, to India; including a residence there, and voyage home, in the Years 1825, 26, 27, and 28. Amongst other things, she writes about British Consul Henry Salt and his antiquities: "We were fortunate enough to be present, when Mr. Salt opened a packet of curiosities from Thebes, which was sent to him by his agent, who was established there for the purpose of making the collection. . . . There were also several mummy necklaces, with small, and by no means un-pretty ornaments hanging to them, resembling delicate seals; also several scarabei, and other trinkets, of some of which the Consul kindly made me a present. What a pity it was that the members of our Government should have been seized with such an unlucky fit of economy, when Mr. Salt offered his collection of curiosities to them for sale, and which, in consequence of their refusing to purchase them, have now passed into the hands of the French, who gave ten thousand pounds for the whole, for, from his knowledge, and power of procuring what was most valuable, they would doubtless have been a noble addition to any museum". See the Travellers in Egypt website at the above URL for the complete extract. This item predicts a surge in ticket sales before the closure of the Tutankhamun exhibit before it moves to Fort Lauderdale. "The museum began selling tickets to members and groups of 10 or more in December and already has sold more than 115,000 admissions to the exhibition, which opens Dec. 15 and runs through April 23, 2006. Another 150,000 tickets were reserved on-line and purchased before the box office opened, said Lynn Mandeville, director of community affairs". See both the above URL for more on these stories. "Starting in 2005, the Oriental Institute is committed to digitizing all of its publications and making them available online, without charge. The minimum for each volume, old and new, current and forthcoming, will be a Portable Document Format (PDF) version following current resolution standards. New publications will appear online at or near the same time they appear in print. Older publications will be processed as time and funding permits". The above is a short review on the Archaeology magazine website of the British Museum's interactive "Ancient Civilizations" website: "Clicking on one of these links brings the user to a world map with a moving timeline that depicts the different cultures emerging on the map and then fading away, evocatively illustrating the civilizations that have existed, and then died out, over thousands of years. Here the museum's collection comes into play as objects are presented, described, and placed within their cultural context through imaginative interfaces". See the above review for more. Archaeology magazine have also published the contents listing for their November/December issue at www.archaeology.org. I've spent the past week half way up a Welsh mountain with no landline connection. I'm back now and I've updated the blog for the past week, posting items with the date showing for when they were actually announced. I may have missed a few items, but hopefully nothing very important. Apologies for the week-long lack of posts. An overview of the Hatshepsut exhibition and where the artefacts were sourced from: "The spectacular objects that have been lent for Hatshepsut: From Queen to Pharaoh were culled from an august body of international institutions by the exhibition’s organizers, Dr. Renée Dreyfus, Fine Arts Museums of San Francisco Curator of Ancient Art and Interpretation and Dr. Catharine H. Roehrig of The Metropolitan Museum of Art, New York, in consultation with Dr. Cathleen A. Keller of the University of California, Berkeley". See the full article for more. "Through April 30, 2006, it will be possible, for the very first time, for the Glyptotek’s visitors to see the museum’s entire Amarna collection in the special exhibition Egyptian Art from the Amarna Period (c. 1365-1345). Moreover, the Glyptotek is taking this opportunity to present three especially important works of Amarna art, which have just been donated by the Ny Carlsberg Foundation. A special press release about these works will be available to the public on the day the exhibition opens". "Egypt is preparing to use the latest technology to solve a 4,500-year-old riddle. A robot is to be sent up two narrow shafts in the Great Pyramid in Giza to discover whether a secret burial chamber contains the real tomb of the pharoah Cheops, also known as Khufu. The chief Egyptian archeologist, Zahi Hawass, is to inspect the robot designed by Singapore scientists later this week". See the full article for more. An article about the financing of the Tutankhamun exhibition: "New York's Metropolitan Museum of Art, which hosted the Treasures of Tutankhamen in 1978 and helped organize the original tour, declined to show Tut this time, citing a 1987 policy of not charging for individual exhibitions. The Met's suggested admission is $15. Ticket prices for Tutankhamun were set by the host museums and Arts & Exhibitions International, which co-produced the exhibition with National Geographic and also produced Diana. The show is financed by AEG, formerly the Anschutz Entertainment Group, which owns and operates the Staples Center in Los Angeles and promotes rock concerts. Ticket prices factor in a $5 million guarantee per museum for the Egyptian government, which owns the artifacts and stands to receive as much as $10 million per venue if the show meets certain attendance goals. Each of the museums hosting the exhibition agreed to the terms, says Arts & Exhibitions International founder and President John Norman. The money will be spent to build new museums in Cairo and to restore Egypt's archaeological treasures. But some question the value of paying four times the normal price of admission to see an exhibition while jostling for space with hundreds, perhaps a thousand other people". An article about visiting Egypt as a tourist: "It may be some sort of mummy's curse. Nearly all of us who visit Egypt will find ourselves on a Nile cruise. But it does make sense: The ancient blockbuster sights are situated along this ribbon of life that slashes the country north to south. Once on board, though, cruisers may find the sightseeing stops frustratingly brief, the crowds oppressive and the number of ships jockeying for position at the docks boggling. As many as 400 boats ply the Nile during high season. Most work the same 125-mile stretch of river, between Aswan and Luxor, and most visit the same attractions on a typical three- or four-day voyage. So even on a luxury cruise, you could end up traipsing across six other ships to reach the dock, only to be wedged into a sacred sanctuary with hordes of sweaty travelers. But spend a night or two on land at the end of a cruise and you'll see attractions that aren't overwhelmed by mobs of package tourists and sense the rhythm of Egypt's 5,000-plus years of history. If you want to get a deeper feel for the "splendors of Egypt" (every tour brochure's fave phrase), you really should jump ship". See the article for the full story. An article about the impact of Tutankhamun on purchases on the Baltimore Sun website: "Savvy buyers - from specialty stores to discount home furnishings retailers - have recognized that King Tut's return to the museum circuit could mean a new epidemic of pharaoh fever". More about the problems at the Getty, and their impacts on the antiquities world in general: "The internationally renowned Getty finds itself deflecting a barrage of questions about how it amassed its world-class collection of Roman, Greek and Etruscan works. And the art world is left to wonder whether the museum's current dilemma will refocus attention on how art is acquired". More on the new Hatshepsut exhibition: "It is good to be the king. It is good to be the queen, too. But what if you are both? No problem. It's doubly good. An Egyptian woman who lived nearly 3,500 years ago had it all figured out and managed to pull it off in grand style . . . . Her story is superbly told in the museum's major inaugural exhibit, Hatshepsut: From Queen to Pharoah". See the article for more. "The game is set in 1930s Egypt, a time of great excitement surrounding the new discoveries there, and stars the Indiana Jones-esque Allan Scott. Scott will be visiting Cairo, Luxor, the valley of the Kings, the Fayum oasis and other exotic locales on a journey into Egypt's past inspired by true history". See the above URL for more. "It seemed that the Egyptian Museum's basement had been afflicted with the Pharaohs' curse. Three weeks ago, when the Giza archaeological inspectors asked for the return of 14 objects placed on loan with the museum last April to celebrate World Heritage Day, curators realised that three of the pieces had vanished. In an attempt to find the missing objects up to 40 inspectors have been exploring the museum's basement, sorting through the overwhelmingly large collection of stored artefacts, but with no luck. That was until early this week, when the Tourism and Antiquities Police (TAP) arrested two men who were trying to sell the objects to a policeman working undercover as an antiquities trader. Culture Minister Farouk Hosni has called for an investigation into the theft". See the full article for more. "The Ptolemaic rulers who inherited Egypt after the untimely death of Alexander the Great governed successfully for three centuries mainly because they were politically and culturally accommodating: they ruled both as Greeks and Pharaohs, and respected local traditions. The Romans did likewise; and although the emperors left Egypt to be controlled by governors while they resided in far off Rome, they had themselves depicted as Pharaohs on temple walls and observed seasonal and national festive occasions, and Romans in Egypt were buried in the traditional manner. Even after the introduction of Christianity to Egypt in the fourth century, when the Eastern Roman, or Byzantine, Empire launched a war on paganism, many of Egypt's most enduring traditions survived". See the Al Ahram Weekly article for more. Short news bulletins which have been reported here previously but may be useful as a short recap. "Egyptian motifs are found throughout our culture, he notes, in everything from tattoos (the ankh and the eye of Horus are particularly popular) to the pyramid on the back side of the $1 bill and that towering obelisk, the Washington Monument, far taller than any ancient Egypt ever had." A rather entertaining listing of things Egyptian-influenced in the US. "You might think the Ancient Egyptians too remote in time to be anything other than intellectual curiosities for us. Jan Assmann, the great German Egyptologist, thinks otherwise. Early on in his masterful reconstruction of the Egyptian mind set, he tells us that 'ancient Egypt is an intellectual and spiritual world that is linked to our own by numerous strands of tradition.' A brief review can only barely touch on the topics discussed in this book, but I will try to give some examples of Assmann’s conclusions with reference our links to the Ancient Egyptians--they may be more extensive than you might think". "Egyptian Supreme Council of Antiquities (SCA) is taking legal steps to retrieve some antiquities to be sold at auctions in the world, the Egyptian Gazette daily reported Tuesday. SCA Secretary General Zahi Hawas said 13 websites were advertising Egyptian antiquities for sale at auction this month, while the total for July was 22 websites. SCA's Archaeological Department has collected all brochures of these auction halls and forwarded them to Public Funds Prosecution, said Hawas". See the article for more. "While it first appeared in a tomb in the resting place of Thutmose's aunt and stepmother, Hatshepsut, Thutmose's burial place is the oldest existing copy of the book in a tomb. Now, thousands of years after he died in 1426BC, his obsession with immortality has been brought to life in the exhibition. Immortal Pharaoh: The Tomb of Thutmose III has just had its launch in Edinburgh ahead of a world tour next year". See the article for more. "The Supreme Council of Antiquities (SCA) is taking legal steps to retrieve some antiquities, which, according to the Internet, are to be sold at auction halls. SCA Secretary-General Zahi Hawass stated that 13 Web sites were advertising Egyptian antiquities for sale at auction this month, while the total for July was 22 Web sites. The SCA's Archaeological Department has collected all the brochures of these auctions halls and forwarded them to Public Funds Prosecution, said Hawass, adding that an SCA committee has carefully compared the antiquities in the brochures with photos of Egypt's missing antiquities.He added that some of the missing items belonged to an Egyptian trader, while others had gone missing from the museum at Cairo University's Faculty of Archaeology and the storehouses of the university's Faculty of Arts, as well as from an archaeological area at Marina, on Egypt's North Coast. The committee has identified the items up for auction as antiquities that have gone missing from Egypt". This is the entire item on the Egyptian Gazette website. "Minister of Culture Farouq Hosni okayed plan to renovate silver artifacts and antiques on display at the Egyptian Museum. Dr. Zahi Hawwas, Secretary General of the Supreme Council of Antiquities, said the renovation is part of a master plan by the Ministry of Culture to maintain the metal artifacts through a 75,000 euro grant from the European Union. Some 1,400 ancient pieces, including sarcophaguses, jewellery, crowns, belts and statues will be renovated". This is the complete news bulletin on the SIS website. "Egyptian police arrested two men on Saturday in connection with the disappearance of three 3000-year-old Pharaonic statues from the basement of the Egyptian Museum in central Cairo. Police captured the men, both of them employees of a company contracted to do restoration work in the museum, in a sting operation with officers presenting themselves as antiquities dealers. The statues, one representing a man and his wife side by side, another the head of the royal guard and the third an unknown character, vanished from the museum last month under mysterious circumstances. Police said that the suspects smuggled the artifacts out of the building in bags that they used to remove rubble from the basement of the museum, which explained why they were not searched at the gates. The arrests men came just days after culture minister Farouk Hosni ordered a probe into reports about damage to another Pharaonic statue, also during restoration work at the museum". This is the full item on the Middle East Times webpage. "Egypt will send a robot up narrow shafts in the Great Pyramid to try to solve one of the mysteries of the 4,500-year-old pharaonic mausoleum, Egypt's top archaeologist said on Monday. Zahi Hawass told Reuters he would this week inspect a robot designed to climb the two narrow shafts which might lead to an undiscovered burial chamber in the pyramid of Cheops at Giza, on the outskirts of Cairo. Hawass said the shafts and stone panels which block them could mark the location of the burial chamber of Cheops, also known as Khufu. That would mean none of the chambers already discovered in the pyramid were the pharaoh's real tomb. The shafts were last probed in September 2002, when a robot drilled a hole through one of the stone panels to reveal a small empty space at the end of which lay another panel, which appeared cracked and fragile. The new robot, designed by a university in Singapore over two years, would drill through that panel and the stone slab blocking the second shaft". See the article on the Reuters website. I've included this article because although it doesn't mention Egypt, it deals with a subject that is of concern to many archaeologists looking at the rock art of Egypt, including that of the Eastern Desert. This article highlights some of the man-made problems facing those wishing to conserve the art, including graffiti and the actual physical removal of some pieces: "Unlike the rock art buried deep in caves in southern Europe, African art was painted and etched on rock faces far more exposed to the elements - and the public. Looting of the treasures also seems more commonplace". Second part of Zahi Hawass's piece on the Egyptian Gazette website entitled How I found my true love archaeology (Part 2) reproduced here in full because it will be replcaced tomorrow: "In1976, I became an inspector of the Pyramids of Giza. I was working at Abu Simbel, the Nubian site of the temples of Ramses II, when I read that thieves had broken into the storage house at Giza and had taken dozens of artifacts. Dr Gamal Mokhtar, head of the Department of Antiquities, knew of my administrative abilities and believed I could make sure this would never happen again. One month later, we caught the thieves and all the artifacts were returned. They are still in jail today.In 1977, Bahariya Oasis was put under the same jurisdiction as the Giza monuments and I went to visit the site. It is funny to think back that I was standing on one of the most exciting archaeological sites of the millennium and was not even aware of it. I realised this was virgin site but I never thought that I would excavate there. I was concerned with the protection and conservation of this site with only six guards and no Antiquities Inspector. No one from Cairo was willing to live in this remote site. So, in 1980, I returned to Bahariya to see about renting an office but I was granted no funds to support it. I recommended a young man from Bahariya, Ashry Shakr, a first-year student in archaeology to the Antiquities Department to open an office for us. I then accepted a Fulbright Scholarship to obtain my doctorate in Egyptology at the University of Pennsylvania and travelled to the United States.In 1987, I returned to Egypt. The Antiquities Department had appointed Ashry Shakr as Antiquities Inspector of Bahariya. I was promoted to Director General of Giza, Saqqara, and Bahariya Oasis. I began work immediately and plunged into the thick of things, dealing with many problems". Third and possibly final part of Mazur's research into the Dorak mystery. More about the artefacts missing in the Cairo Museum: "To recover the lost artifacts—statues approximately 20cm tall—Hawass appointed a committee of “seven to eight” archaeologists to search the colossal basement. He claims they have been looking for over a week, but nothing has been found. Hawass says the committee’s task is to 'survey and list everything in the basement' in order to bring some order to the cluttered abyss. There are approximately 120,000 artifacts in the museum, and thousands more in the basement, according to museum curator Lotfi Abdel Hamid. No one knows the exact numbers". See the above page for more. "107,450 tourists from different nationalities visited the valley of kings in Luxor during September 2005, compared to 3797 Egyptians visited the site during the same month. Revenues from tourists hit LE 5.832 million compared to LE 7594 from Egyptians". This is the full bulleting from the SIS website. "Egypt, Sudan to promote cooperation in antiquity field. The start of a giant Egyptian-Sudanese project in the field of antiquities was announced by Regine Schuiz, Chairperson of the International Committee of Egyptology at the International Council of Museums (ICOM). At a news conference recently held on the sidelines of a conference of museums at Alexandria Library HQ, Schuiz told reporters the project would be held under the umbrella of ICOM and the United Nations Educational, Scientific and Cultural Organization (UNESCO). She said that Cooperation will involve the establishment of a museum for Nubian antiquities in Sudan's Wadi Halfa near the borders with Egypt". See the above page for more. "The International Council of Museums (ICOM), the international non-profit organisation for museums and museum professionals, has held its AGM in Alexandria, and it went off without any of the glitches which had been expected to dog the meeting . . . . In his speech, delivered by Sabri Abdel-Aziz, head of the Ancient Egyptian section at the Supreme Council of Antiquities (SCA), SCA Secretary-General Zahi Hawass revealed the council's new philosophy to convert Egyptian museums from large showcases for genuine artefacts to huge cultural and educational institutes". A lengthy and detailed overview of the AGM, and an important insight into ways in which Egyptian heritage is being stored and displayed. See the full article. Zahi Hawass's occasional Dig Days column on the Al Ahram Weekly website, this time looking at the Imhotep Museum, named for the Old Kingdom pyramid architecht: " We have begun a new phase of the site management programme at Saqqara by building new offices, new facilities, and housing for foreign expeditions on the plateau. Later every modern building on the plateau will be demolished. However, the most important building, not built yet, will be a new museum, the Imhotep Museum. This museum will exhibit major artefacts discovered on the site, which is why we call it a site museum." "One part of Egypt that perhaps to this day gets scant attention -- the vast desert stretches of the Sinai -- was in the news in the summer of 1937 following the theft of buried antiquities and a subsequent court trial which rendered a surprising verdict. Professor Yunan Labib Rizk follows the case of the stolen goods". See the above URL for the story. "He liked to work in his underpants and ate only from tins, but Flinders Petrie changed the face of archaeology". Joyce Tyldesley writing about Sir William Flinders Petrie, who transformed archaeological investigations in Egypt. Some of Petrie's Egyptian collection can be found at London's Petrie Museum of Egyptian Archaeology, which has a full online database of the collection's artefacts. Miniseries producer Hallmark Entertainment is going back in time to offer a new take on the discovery of King Tut‘s tomb in a project starring Malcolm McDowell and Casper Van Dien. The company recently wrapped shooting in India on "The Curse of King Tut‘s Tomb," a four-hour miniseries billed as a fact-based fantasy adventure. It‘s set mostly in the 1920s but includes flashbacks to ancient Egypt. Van Dien plays an archaeologist in the 1920s, while McDowell portrays Van Dien‘s nemesis, the head of an organization named Hellfire Club. Leonor Varela ("Blade II") portrays an archaeologist with whom Van Dien initially spars but who ultimately becomes a love interest, while relative newcomer Francisco Bosch ("Alexander") plays Egyptian pharaoh Tutankhamen. "It‘s a combination of being a fantastical adventure (and) a very touching, heartfelt romantic story," director Russell Mulcahy said, adding that the miniseries is "quite heavy on the effects side." It‘s unclear what network the miniseries is headed for; Hallmark Entertainment declined comment on potential network homes. A game suggested on the above prnewswire webpage for kids at Hallowe'en: " Mummy Wrap: In this game kids are granted the power to mummify. Divide kids into teams, and hand each group a roll of toilet paper. Give the teams a few minutes to decide who, in each group, will be the mummy. Then shout "Mummify! Mummify! Mummify!" and watch while teams race to wrap up their mummy first, using every bit of paper. The first team to finish wins!" I've seen grown adults play this and fall about laughing. An article looking at the organization and finance behind the Tutankhamun exhibition: "The show is produced by three organisations: AEG LIVE Exhibitions, which owns London’s Millennium Dome and is one of the leading sports and entertainment companies in the world; AEI, a private company that organises touring exhibitions, including a recent one about the late Diana, Princess of Wales; and National Geographic, the nonprofit scientific and educational organisation. AEG finances the show, AEI manages production and some of the logistics of the tour, and National Geographic produces related books and films. The three share in the shows’ profits, together with each of the venues and Egypt". See the article for more details. "An admirer of Egyptian culture, Eduardo Vilela has already travelled to the Arab country to photograph the originals and then transform them into replicas. Some of his works, like sculptures and pictures, may be seen at exhibition 'Ancient Egypt - Myths and Symbols', which has been travelling Brazil since 1997 and will take place in the city of São José dos Campos, in the interior of Brazil, from October 18th to November 2nd". See the article for the full story. "Hosni insisted that he was determined to find the officials responsible for wrecking the treasure, ignoring his subordinate's denials. On top of this latest uproar, numerous artifacts have been vanishing from museums and archaeological sites around the country, leading to accusations that Egypt is not doing enough to protect its rich history or ensure safety standards at entertainment venues. Instead the Culture Ministry officials are arguing among themselves. A few weeks ago, officials announced the disappearance of three artifacts from the Egyptian Museum basement, which houses thousands of priceless treasures from different periods". See the Daily Star article for more details. An artilce about savig the Temple of Hibis in Kharga Oasis: "Cintec manufactures structural reinforcement anchors [Newport, Wales, U.K.] from an ordinary looking office in the city centre - not the most glamorous of jobs, one might imagine. But for the past decade the Cintec team have been doing their bit for archaeology in ancient Egypt, stabilising mosques many hundreds of years old, after damage from the earthquakes of the early 1990s. And today they're in the middle of their most exciting venture yet: restoring the Temple of Hibis in the Kharga Oasis". See the icWales web page, above, for more about the restoration of Hibis. "Egyptian Culture Minister Faruq Hosni ordered a probe into reports about mysterious damage to a pharaonic statue during restoration work at the Egyptian Museum. He asked Attorney General Maher Abdul Wahid to investigate the matter, the official MENA news agency reported, only hours after the country's top antiquities official dismissed the reports as being unfounded. The Egyptian press, quoting museum officials, had reported that a statue of Khafre (2576-2551 BC), the fourth dynasty king and builder of the second pyramid at Giza, had been found damaged in the basement". At the same time, Zahi Hawass is apparently denying both that there is any damage, or that there is any evidence to suggest that the statue represents Khafre. See the full article on the Yahoo News website for more. "Al-Arish museum is getting ready to receive tourist as monuments pieces are being moved to it from eight other museums in preparation for its inauguration, expected to be within days. The construction works of Al-Arish museum lasted for five years with costs of 50 million pounds, Culture Minister Farouk Hosni said. Celebrations marking the inauguration of Al-Arish museum are coinciding with the October victory celebrations, the Minister added. Al-Arish museum is to display the history of Sinai from the prehistoric era till the Islamic rule, Zahi Hawas Secretary-General of the Supreme Council for Antiquities said". This is the entire news bulletin from the State Information Service website. "Hailing from the deserts of Egypt, across the Atlantic Ocean, and now settled snugly for a limited time in Orange County, comes the Bowers Museum’s Mummies: Death and the Afterlife in Ancient Egypt … Treasures from the British Museum. This mummy exhibit, designed by Paul Johnson, who is the Bowers Museum director of exhibition design, introduces visitors to the Egyptian perspective of death and the afterlife through 140 ancient Egyptian artifacts, including 14 actual mummies and coffins, the largest exhibition to be shown by the British Museum outside of the United Kingdom. After hosting Egyptian treasures from the British Museum in 2000, a friendship developed between Bowers director Peter Kelly and the British Museum’s director, Neil MacGregor. This friendship led to a 10-year contract between the two institutions, making the Bowers the American partner of the British Museum. It was “like winning the Superbowl,” said Rick Wienberg, Bowers director of marketing and public relations. The first exhibit to be shown at the Bowers since signing the contract with the British Museum was a Queen of Sheba gallery; the second is the current Mummies: Death and Afterlife in Ancient Egypt which is open now until April 2007". See the full article for more. There has been some considerable interest expressed in the whole saga as a result of Suzan's original piece. Here's an extract from the very beginning of the follow-up: "Although many art experts prefer not to say so publicly because they otherwise like and respect James "Jimmie" Mellaart, the British archaeologist at the heart of the matter -- and/or are afraid of reprisals -- they largely agree that Dorak was some kind of ruse. The outstanding question is, of course, why it happened. Which only Jimmie Mellaart knows. However, because some are still in denial over the evidence presented, I've decided to highlight a few comments in an attempt to further clear the air regarding existence of the artifacts that Mellaart claimed were dug up clandestinely in northwest Turkey from two royal tombs of the Yortan, neighbors of the Trojans". See the article for the full details. Marion True, curator of the Getty, has retired following allegations about financial arrangements (the top URL), and Italian court case continues to pick up pace with the Getty now "donating" three of the disputed artefacts to Italy (the second URL): "Italian officials traveling to Los Angeles will receive the artifacts 'within the next few days' in the form of a donation from the Getty, ministry spokesman Walter Guarracino said. He said the donation formula allows the museum to avoid admitting any wrongdoing in the acquisition of the objects and doesn't alter Italy's position in its trial against Getty antiquities curator Marion True". It is likely that other nations that have disputed ownership of items with the Getty (like Egypt) will be waiting for the outcome with some interest. See the full articles for more. Quite a long piece looking at the SGI unwrapping of the child mummy Sherit. This is probably the most detailed description both of the SGI process and the results of the analysis of Sherit that I have found so far: "Two thousand years ago in the sands of Egypt, grieving parents put their tiny child to rest in a way that was customary even during the time of Christ. They removed all of the youth's organs except for the heart, packed the remains in salt to cure them and wrapped them in linen coated with perfumed resin. Like all Egyptians of the age, they were certain that their careful efforts would prepare their loved one to someday come back to life. Today in Silicon Valley, a team of world-renowned experts proved those parents right — although the mummy's high-tech resurrection may not quite be what ancient Egyptians had in mind". See the above URL for the full story.